The reason you haven't heard from me in a couple of weeks is that my life has been sideways lately. It started with a tingling in my feet mid July and after googling my symptoms (never recommended!) I had convinced myself I had MS (which is my biggest fear). After visiting my DR she did a short neurological exam and gave me a requisition and told me to stay calm until Monday's blood work. Easier said than done as I spent that weekend in a state of heightened fight of flight, terrified of the worst case scenario and experiencing constant panic attacks. My heart palpitations and symptoms were so scary that I went to the ER early that Sunday morning where I had an ECG and a thorough neurological exam, after which the DR was reassured I didn't have MS. When my blood work returned, it showed deficiencies in vitamin b12 and iron, both of which cause tingling and even symptoms that mimic MS. As I've been living as a vegan for a year and a vegetarian for 4 years before that, I wasn't getting anywhere close to enough b12, as this is the only nutrient found solely in animal products or fortified meatless products (which I try to avoid as they are often heavily processed). Even though the DR's are sure I don't have MS, I can't get the idea out of my head so I'm on anti-anxiety medication and sleeping pills and am spending the next couple of weeks in Nova Scotia trying to relax with family. Needless to say, as much as I love eating plants based and supporting animal rights, my health is my number one priority so besides taking high dosages of vitamin b12 & iron supplements daily, I am also slowly re-introducing fish, dairy, eggs and possibly poulty back into my diet. My hopes is that in the next couple of months I can get my levels back to normal, reverse the tingling sensations (which come on unannounced in all areas of my body, highly exasperated by anxiety). For now I'm just trying to live in the moment, let go and let God and recognize the sensations as tingling, without attaching a disease or irrational fear to them. Have you ever had a health scare that caused you extreme anxiety and worry? Oh, honey. I am sorry. I found a lump in my breast a few years ago and was convinced I had breast cancer. I couldn't eat, couldn't sleep and couldn't stop crying. It took a week or so to get the all clear and I was fine, but it was terrifying. I have low iron, so whenever I try to WebMD the slightest thing, it always always always comes up as leukemia. It does start to freak me out! A dr once sent me for a CT scan of my abdomen, because something felt "off" during a routine exam. I told him it was a gas bubble. He told me it could be non-Hodgkins lymphoma. It was... a gas bubble. IT's taken some work, and sometimes i still freak out over weird body things, but I finally have a doctor whom I trust, and who trusts me, and that helps a lot! when I was a lot younger I had horrible problems with nose bleeds. it was a nightmare and I was scared of every new day. don't even want to talk about it but what I want to say is that I know how it feels to be scared and what hopelessness means. when it comes to your condition I wish you all the strength and luck and every other good thing and I hope eating those "new" things isn't too hard. it's all for your own good and for example salmon tastes wonderful! (says me who doesn't eat any other fish) oh and what a beautiful outfit that is! full of happy shades and wonderful accessories. I love your bag. It's scary when you are having medical issues until you find out what's going on. I had 2 panic attacks that came out of nowhere a couple of years ago and the dr. put me on a heart monitor for a month. It ended up being too much caffeine and the fact that I never take a break and relax. Hopefully you can get back on track soon! I'm glad you figured out what was wrong and that you are on the mend! That sounds scary for sure. I hope things keep getting better! Aw Em, that blows :( I can't imagine how anxious you've felt. Especially when it's unexplained and you have no idea how serious it could be.. I thought I had appendicitis once (didn't, just ovarian cysts they think) and that was scary, I made myself physically ill with worry. I hope you start to feel better soon. Oh, dear. I'm sorry, buddy. Anxiety is so painful and not knowing what ails our body is a potent source of worry. I hope you start feeling better soon. As one of your vegan friends, I can tell you that no one from The Vegan Police is coming to haul you away to Vegan Prison. PLEASE take care of yourself and do what you need to do to get healthy! I'm sure it's upsetting and scary, but you can't live a compassionate, kind life if you're sick in bed from malnutrition. Breathe...and let it go. I'm wishing you a speedy recovery. Eat healthy and let your momma take care of you! man, all this sounds really scary. I hope you're able to get everything back to normal with the dietary changes. this isn't the first time I've heard of strict vegans having major nutritional deficiencies, my formerly vegan friends sent me the book - real food for mother and baby by nina planck (which I haven't finished yet) that has an interesting take on eating. also in my Fresh cookbook one of the founders (Ruth) writes about how her vegan lifestyle affected her long term and the changes she recently made. might be interesting to read other people's experiences? I hope it's not MS and your symptoms go away soon. off topic the dress is cute, very lady-like & you! Oh Em! this sounds extremely stressful and scary. I cant even imagine what youre going through. Hopefully some R&R and changes to your diet will help with this. emily, i'm so glad you're ok. you must have been terrified. you have to do what's right for you. 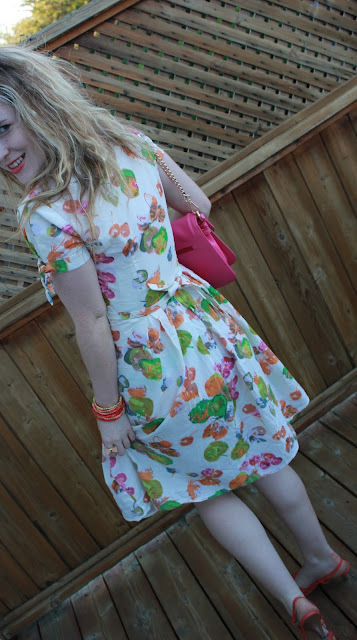 you look lovely in your floral dress, with pink, orange, and blue accessories. enjoy your resting and sending love. Oh man. So sorry to hear you're not well. I've struggled with anxiety in the past as well as unexplained illness. It sounds like your doc is figuring things out. Best of luck on you recovery. P.S. 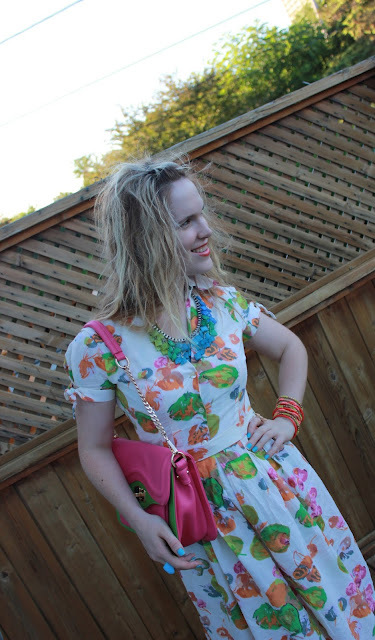 adorable dress and love your purse. Oh no! Take care of yourself! That is so scary. I'm relieved to hear your symptoms were diagnosed and that you'll be able to get them under control with some changes to your diet. There's nothing like going home for some R&R for feeling better. Enjoy my dear.